Check out all the awesome pictures from GOSSIP GIRL‘ new episode, “Summer, Kind of Wonderful” airing Monday, September 1, at 8pm on The CW. That’s right Upper East Siders, Gossip Girl is back for an all new second season. What type of troubles will S & B get themselves into this year? What about Chuck, will the bad boy be back or will we see a sweeter side of him again in Season 2? And Nate, what is up with him? Hopefully, he’ll have a more interesting storyline this season. And what about that new guy, Marcus, with Blair? All I can say is I’m so glad Gossip Girl is back! You can see more photos from Gossip Girl “Summer, Kind of Wonderful” below. Read all our Gossip Girl coverage here. 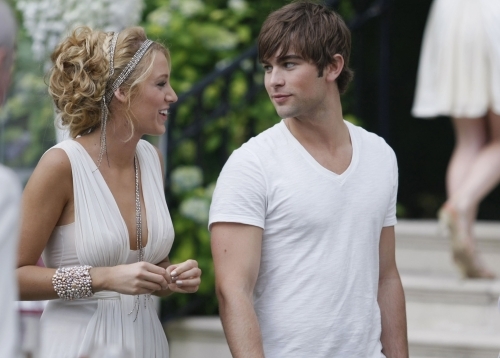 Episode Synopsis: “Summer, Kind of Wonderful” – As the summer draws to a close in the Hamptons, Serena (Blake Lively) and Nate (Chace Crawford) have everyone fooled into thinking they are a couple to cover up the fact that Nate has been hooking up with a married older woman (guest star Amick) and Serena has been secretly mourning her break-up with Dan (Penn Badgley). Blair (Leighton Meester) returns from abroad with a hot guy on her arm (guest star Patrick Heusinger), making a very jealous Chuck (Ed Westwick) question his decision to leave Blair stranded at the heliport. Dan has spent the summer assisting a famous author (guest star McInerney), but decides to head to the Hamptons to see how things stand with Serena after a summer spent apart. While interning for Eleanor Waldorfâ€™s company, Jenny (Taylor Momsen) sneaks an invite to a much-coveted Hamptonsâ€™ White Party at which Eric (Connor Paolo) introduces her to socialite Tinsley Mortimer.